Question #1: Does BC need to orient the baseball stadium in order to keep home plate in the SW corner? Answer: ACC stadiums are oriented in all different directions. Orientation is clearly not a driving factor in their design. Statements made at the 3/20/07 BC Task Force meeting appear to have been misleading. 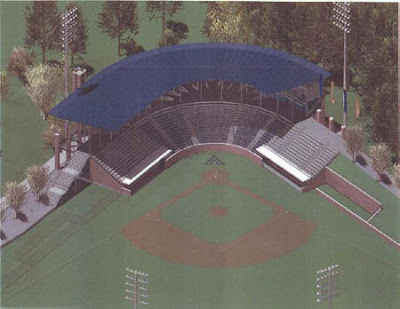 Question #2: Was it true when a BC official said on 3/20/07 that even with a 2000-seat stadium, BC would still have the smallest baseball stadium in the ACC? Answer: The BC official was factually in error. Virginia Tech has a smaller stadium at 1033 seats, and BC's 2000-seat stadium would actually tie them for 9th place (3-way tie with UVA and UNC). Note that during the April 25, 2007 subcommittee meeting of the BC Task Force, a BC official noted that 2000 seats are a minimum requirement of the ACC for tournament games, not for regular season games. The field lights are roughly 80-feet high. So the stadium appears to be 40 (or 50) feet high by comparison. The grade between the field and Lane Park is roughly 15 feet, so a structure like this would stick up roughly as high as the tops of the houses along Lane Park. Want To Encourage Kids to Walk to School? Here's a 66-page manual on it. Seriously, though, it is a good idea for the kids as well as the environment. Baseball stadium sizes and orientations across the ACC: are the requirements necessary? Is there space to move the stadium away from houses? How tall is the lighting compared to neighboring houses? Neighbors of Rogers Park (and members of the Friends of Rogers Park) have been specially invited to attend the meeting in order to provide their insight into what it is like to live near to lighted baseball fields. at the Brighton Elks Lodge, 326 Washington Street, Brighton Center. Archdiocese property), and related buildings. plans (e.g., the proposed re-routing of Saint Thomas More Road). 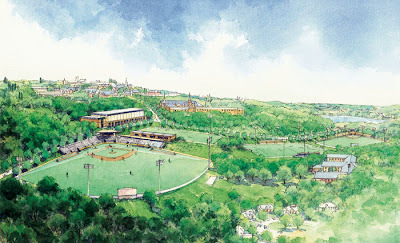 For background on the athletics facilities proposals, see this blog entry. Officials of Boston College, and their associates, presented various details of their master plan on "traffic and transportation" to the April 17, 2007 meeting of the BC Task Force. What is their plan to reduce the one person / one car "mode share"? How many cars (parking) and people (transportation) would be moving from the main campus to the Brighton Campus? BC has made many statements of no net increase in numbers of people***, but their plans clearly move people from easily accessible sites on the main campus to less accessible sites on the Brigton Campus. Harvard has made clear that their plan for Allston encourages bicycle use. BC avoided the topic altogether. Would any bicycle lanes on streets be introduced? Where? Would there be any bicycle paths on their main campus? Will the development in the Brighton Campus include any bike-friendly paths or lanes? How to connect bicycle routes between each of BC's campuses? Increasing bicycle parking locations, showers, etc., to encourage bicycle commuting. Do they even have a complete inventory of their bicycle parking spaces (racks) and shower facilities? Students and cars: Zip cars on-campus could reduce demand for on-campus student parking and off-campus illegal parking. Can you think of any more that they left out? *** NB: This topic will be addressed in a future posting... they may have left a lot of people out! Who Else Is Violating the Massachusetts Open Meeting Law? In Springfield, the state-run Finance Control Board voted behind closed doors last year to give Schools Superintendent Joseph P. Burke a $13,000 raise and one-year contract extension. After an appeal by The Republican, Hampden District Attorney William M. Bennett ruled that the vote should have been taken in public. He ordered the board to avoid any further violations. In Boston, the City Council was caught skirting the law 11 times during a two-year period. In a 20-page ruling last year, Suffolk Superior Court Judge Nancy Staffier Holtz slapped the council with an $11,000 fine after concluding that the violations were intentional. And in Amherst, the Select Board suffered two rebukes from Northwestern District Attorney Elizabeth D. Scheibel for illegally using e-mails to conduct business - once in 2005 to discuss the July 4 parade, and again in 2006 to discuss the Amherst Survival Center. Norfolk County District Attorney William Keating’s office has investigated 97 allegations of Open Meeting Law violations in the past five years, and last year found five such violations. Plymouth County District Attorney Timothy Cruz’s office investigated 106 in the past five years and found 24 violations. According to the lawsuit, the City Council held 10 closed-door meetings -- from June 3, 2003, to March 24, 2005 -- to discuss a request by the Boston Redevelopment Authority to renew its urban renewal program. The suit also alleges that the City Council held a secret meeting on Jan. 20, 2005, to discuss the exposure of three Boston University lab workers to bacteria from tularemia, an illness caused by exposure to rabbits. The problem is that there is no state requirement for collecting and tracking complaints of violations of the law. At least Massachusetts Common Cause is attempting to do so as a watchdog group. At the community walking tour of the St. John's Seminary land on Saturday, April 21, guide Wilma Wetterstrom brought along copies of the 1875 map of the property. I've laid it side-by-side with a modern, satellite image of the property. This and other historical maps of Allston-Brighton have been scanned in by the Brighton Allston Historical Society, and are available online. A great resource. The Allston Brighton TAB reported that the historic house at 1954 Commonwealth Avenue has been placed back on the market. The current owner bought the house in 2004 and has since sought approval to demolish or move it. Since it is located in the Aberdeen Architectural Conservation District and presumably contains a restriction against demolition on the property's deed, the Boston Landmarks Commission recommended against both moves. It's nice to see the system work the way it should by blocking a developer's bad idea. Bravo to the local activists and BLC for fighting this one. This owner is about to get stuck with a loss in his real estate speculation. He paid $2.8 million for it, but it is only assessed by the city at $1.1 million, so it is unlikely he'll get back his cost -- much less his $3.3 million asking price. As the TAB reports, however, the owner isn't mentioning the deed restriction in his listing. And he has listed it under land/commercial properties, rather than the 3-family residential unit it is. Please, please, don't sell it to another developer and put the neighborhood through this again. Watch Out at Chandler Pond! Somebody needs to teach this Canada Goose some manners. The focus of the walking tour will be to view the open space, inspect the topographical features, and discuss the historical background of the site which contains the locations of several developments (new buildings and athletic stadiums) proposed by Boston College as part of its master planning process. The tour will be led by long-time Brighton residents Charlie Vasiliades and Wilma Wetterstrom. One or more representatives from BC will also be on hand to answer questions. The tour is expected to last 1½ hours. Comfortable walking shoes are advised. Rain or shine. PDF flyer can be found here. Photos from the tour can be found here. Yesterday's 111th running of the Boston Marathon had better weather during the race than anticipated. The pace was, nonetheless, slow for all categories. The lead men were still in a 5-man bunch by the time they passed us in Cleveland Circle -- the lead group is usually split up through the Four Hills of Newton. Crowds were also thin. The spectators at Cleveland Circle can be 4-5 people deep during good weather, but they were only one-deep (at best) yesterday. Race officials were effective at directing the wheelchair athletes safely across the tracks at Cleveland Circle, but one cyclist was observed to fall while negotiating the tracks at too shallow an angle. In case you're wondering, bicycles are theoretically not allowed on the course. The first meeting of the grassroots, unaffiliated group, the "Boston College Neighbors Forum," occurred on Thursday, April 12. Approximately 65 residents attended. Let all the voices of the community be heard. Build community consensus on one or more topics. Draft joint letters to the BC Task Force, BRA, BC, and elected officials to convey if consensus were reached on any topic. Twenty-four possible consensus statements were considered, and seven were adopted. A number of other consensus statements appeared to be within reach, but were deferred to a future meeting pending additional information, additional discussion, or improved wording. Two letters were drafted to include the consensus statements reached at the meetings. Attendees were free to sign onto the letters at the meeting; other members of the community are invited to join, too, following instructions below. Letter #1 was drafted in response to BC's proposal to demolish three houses at 188-192-196 Foster Street, and build 70 beds of seminarian, townhouse-style housing on the 5-acre property currently designated as "open space." To sign onto letter #1, send an email by clicking here. Letter #2 was drafted in response to BC's proposals for building and demolishing undergraduate housing, and particularly addressed the issue of putting two of those undergraduate dormitories in the "Brighton Campus" (the former Archdiocese property aka "St. John's Seminary grounds"). It also deals with issues of open space, since the property is currently a Conservation Protection Subdistrict zoning overlay. To sign onto letter #2, send an email by clicking here. 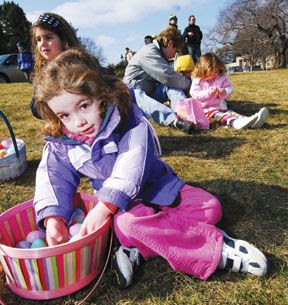 See the cute picture from The Bulletin Newspapers of last Saturday's Easter Egg Hunt, sponsored by St. Elizabeth's Medical Center and held at the Archdiocese's Chancery. 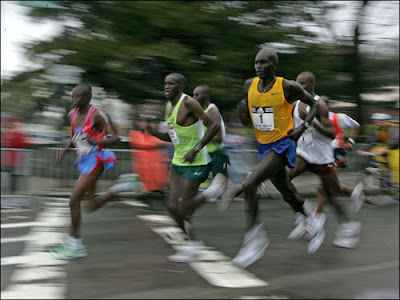 The 111th Boston Marathon will be traversing across part of Brighton this coming Monday, April 16, 2007 (Patriot's Day). Race now starts at 10:00 am (not noon)! When will the athletes be arriving at these locations? Everything is approximately 10 minutes earlier at Heartbreak Hill (20.2 mile mark). BC's Edmonds Hall will "have to be torn down"
"There aren't a lot of empty spots on campus so we have to build very carefully," said Keating, "Cushing, McElroy, Edmonds, the Plex, and More Hall have to be torn down. But you can't tear those down without replacements. It's a musical chairs, domino sequence." Edmonds Hall is a 790-bed undergraduate dorm. The domino effect caused by its demolition would put a 600-bed pair of replacement undergraduate dorms into the "Brighton Campus," i.e., the former Archdiocese's property, according to BC's plans presented at previous BC Task Force meetings. See below for information (click for larger version). Also see the PDF attachment to the BC Neighbors Forum available from this posting. Who Is On Those Task Forces, Anyway? The membership of the BRA's institutional task forces is not generally known. The only way to find out who's on the task forces (other than Harvard Allston) appears to be through private contact with the BRA project manager. Is this the way it ought to be? For example, nowhere on the BRA's website is there a simple list of the current members of the Boston College Task Force, the Harvard Allston Task Force, the St. Elizabeth's Task Force, etc. That said, the Harvard Allston Task Force members can be found by looking at the attendance at the top of the meeting minutes posted on the BRA's site (although you have to paste together attendance records from minutes of a few minutes to get the complete list), or on the Harvard/Allston (private university) website. Yes, you've read that correctly: the easiest place to find the membership list of the BRA's Harvard Allston Task Force is on the institution's own website! The BRA's St. Elizabeth's Medical Center website is recently deceased... even though it ought to still exist to show the approval status of their IMP, and the construction status of their emergency room addition. The St. Elizabeth's Medical Center Task Force never posted minutes on the BRA's website, and the institution's webpage never identified the task force members. although there are already two more (as yet unannounced) positions filled, one or more current members may be leaving, and one or more additional positions will be filled soon. Are we from Allston-Brighton alone in this lack of information? I couldn't find the Suffolk University Task Force on the BRA website, but googling it showed that its activities were documented (task force membership, minutes, filings, etc.) at the institution's website, a website that doesn't appear navigable to from the institution's main pages or from the BRA's. Even if you know the members of the task forces, how would you know how to contact them? Only by contacting the BRA project manager privately, again. No task force member's contact information is listed on any of these sites. We've got only a couple of dozen task force members in all of Allston-Brighton, yet we have 70,000 residents, so there is no way that every resident can be expected to know a task force member personally. The BRA should publish, on their own website, the current membership of their official, advisory task forces. The BRA should publish, on their own website, at least one kind of contact information (email, phone, and/or mail) for each member of the task force. Baseball Stadium: Just "Lights and Seats"
Said Tom Keady, BC’s vice president for community affairs: “The only difference between the existing field on the site and the one we’re proposing is that it will have lights and seats.” Keady noted that the conceptual design at this stage also included building an adjacent structure containing coaches’ offices, batting cages and a weight room. Only adding lights and seats... and a 25,000+ square foot building, too. I think he overlooked a few things. Let's list all the changes, at least those we've been told about at the most recent BC Task Force meeting (March 20, 2007, see this posting). Lights (80-foot high? ), how many watts? Press box (baseball), maybe another for softball? Parking garage next door to support the usage 46,200 square feet [including roof tennis courts? ], 160 parking spaces. High nets to catch foul balls to keep them from hitting Lane Park bedroom windows. #5 means that what is currently "open space" will become "locked space," and #6 means that what is currently "green space" will become "artificial space." #8 is a consequence of BC's requirement (b) for the athletic fields (i.e., to have adjacent parking for athletic facilities) in their presentation to the task force on March 20, 2007. Seems a little bit more complicated than just "lights and seats." The Boston Police Department just announced that they have their new "party line" up and running. A single number, 617-343-5500, is now used city-wide to complain about loud and/or after-hours parties. Since 20% of the city's students live in Allston-Brighton, I can imagine our neighborhood will be among the most active users of the number. St. Elizabeth's Medical Center is hosting the annual Easter Egg Hunt this Saturday, April 7th (rain, snow, sleet, freezing rain, fog, or shine). 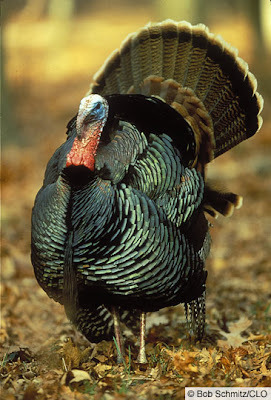 The festivities kick off with a toddler hunt at 9:30 am (under three years old). 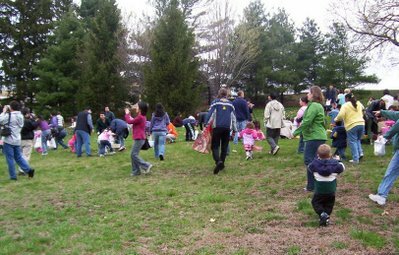 The all-out egg hunt for children age three and over begins at 10:00 am. We don't normally think of zoning issues as exciting. But they're pretty important for what people can do with the property they own, be it residential, commercial, institutional, etc. A nice, though far from exhaustive, discussion of institutional-related Article 80 zoning issues in Boston can be found recently in the BC_Neighbors_Forum, particularly as these relate to BC's master planning process. Will Newton's Own Development Pave the Way for BC's Master Plan? "Apparently a five-story parking garage is not too tall. Needless to say, if these proposals for Newton Centre are accepted, the city of Newton will have little grounds for denying BC the buildings that will be a part of the upcoming campus masterplan." While the editorial does go on to ask Newton to "carefully consider this proposal," the editorial provides a justification for BC's master plans (in Newton) based on Newton Center's development project located a mile or so away. I think that the editors at the newspaper may need a little education on zoning. A structure that is perfectly suited to one site can be wrong for another. We don't build the Prudential Center in Brighton Center, for example, nor do we build student dormitories in the middle of Boston Common. The neighborhood bordering BC's proposed buildings in the upper campus needs to be considered when evaluating if the proposal is appropriate; likewise, the shopping district bordering Newton's proposed parking structure in Newton Center needs to be considered when addressing its appropriateness. 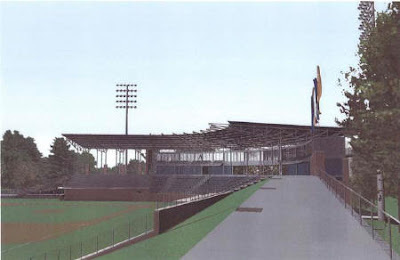 At the March 20, 2007 meeting of the BC Task Force, the BC presenters (and their planning associates from Sasaki) repeatedly referred to the baseball thing they wanted to build on the former Archdiocese property as a baseball "field," despite the fact that it would include 2000-seats for spectators. The same terminology of "field" was used for the 500-seat softball "field" and the no-seat "multipurpose-field." A member of the public queried them directly on this linguistic usage, to which they replied (approximately): "You say stadium, I say field. OK."
A simple definition of stadium found on the web is: "A large, usually open structure for sports events with tiered seating for spectators." Their proposal sure sounds like a stadium to any reasonable person with basic knowledge of the english language. Why did they use the term "baseball field" instead of the obvious "baseball stadium"? Even if BC were to claim that the former Archdiocesan property were to be now included as part of the BC institutional subdistrict overlay (a highly questionable assertion and an involved subject that will be addressed in future postings!!! ), it wouldn't matter: Article 51, Table C, which spells out the zoning for BC's institutional subdistrict, has the same use limitations on "stadium" versus "grounds for sports, private." See the obvious thing here? A "stadium" is "F" (or "Forbidden") in a CPS zoned site (or BC institutional subdistrict), while "grounds for sports, private" (fenced-in field) is "C" (or "Conditionally-allowed"). The BC planners and their associates appear to be deliberately using the term "field" instead of "stadium" in order to slip a forbidden use under the zoning code through a conditionally-allowed use. Instead of deliberately obfuscating the issue, BC's planners should be straight-forward with the BRA, the Zoning Board, and the A-B community by using the terms "baseball stadium" and "softball stadium," since the term stadium is a specific and technical one. The term has a clear meaning within the zoning for the site, and has direct consequences on the allowed uses for the site. Since their upcoming IMPNF (and project PNFs) will generally require regulatory approval of the Zoning Board, this means that their proposals are fundamentally related to zoning issues. They should use the zoning term "stadium" correctly in their public filings and presentations to the public. And I hope they are up-front in the future by declaring that they will need to seek a zoning variance to build a baseball stadium on the site. For everyone in the Allston-Brighton community: we should always use the term "stadium" when referring to the proposed baseball and softball construction projects, and we should hold BC to that standard, too. 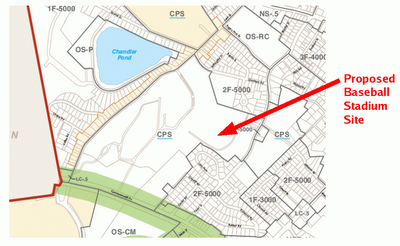 See this previous post for a figure which shows where these various "fields" are proposed to be sited. The BRA's website has the zoning code including maps.